Kushinagar - Where Buddha breathed last - Ghumakkar - Inspiring travel experiences. We started at about 6 in the morning from Darbhanga and after one hour, we have covered 12 long kilometers. We were on a six lane East-West Corridor which was being done and I don’t need to remind fellow ghumakkars that protests and road-blocks happen in my home state, Bihar. Car cabin atmosphere was still very peppy because half of the crew was seasoned and rest of them were oblivious. I moved to 13th KM and was hoping that I reach Kushinagar in time, a brief stop we planned before we spend the night at Gorakhpur. It was late afternoon, when I got close to the holy city and the hope of meeting Gorakhpur before it gets dark, ensured that we spend the limited time in Kushinagar without any undue haste. The city is right on East-West Corridor, the ambitious road project which would connect Silchar in East to Probandar in West, and as you get close you would see a large statue of Lord Buddha, acting like a gate. 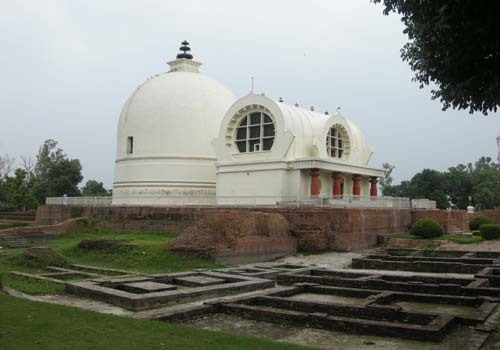 Kushinagar is situated in Uttar Pradesh and is very close to the popular border city of Gorakhpur. It’s one of the four holy places on the Buddhist Circuit and is the place where Mahatma Buddha attained Mahaparinirvana. He was cremated here. In the summer of 2003, I accidentally found myself in Kushinagar. A close friend who belongs to Gorakhpur was getting married and on one of the evenings, when we asked around for an appropriate activity to kill the hot afternoon, we were suggested to visit Kushinagar. We did and we just could not understand that how on earth a place so sacred is devoid of populace. On that trip, a group of four boys walked and walked and wondered and wondered. I even made a small album with captions and later I scanned those photos but later I could not find them. so after five years, I was again at the same place, though it was now Monsoons and I could see lots of people there. ” Now, O Brothers ! I do remind you, all component things are subject to decay. Work for your salvation in the earnest”. This is the last sermon which Buddha preached, in 543 BC at Kushinagar. It is said that on the day of ‘Magh Purnima’, he was at Vaishali and he decided to take Mahanirvana in Kushinagar. When he died, the then kingdom of ‘Mallas’ constructed a big stupa. Later, Ashoka renovated it. I read somewhere that the Chinese travelers Fa Hien & Hieun Tsang have mentioned “Kushinara” in their Travel Memo. Kushinara continued to be living-city till the 12th century A.D. & was thereafter lost into oblivion. After extensive excavations main stupa was exposed in 1876 AD. 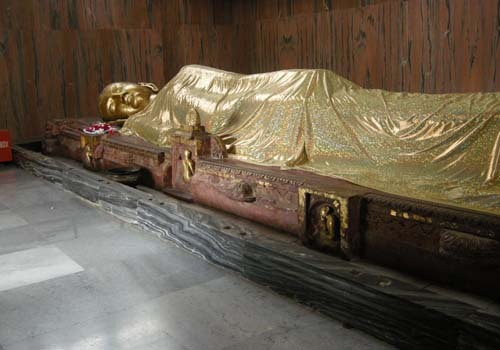 In addition a 6.10 m long statue of reclining Buddha was discovered. Ven. Chandra Swami a Burmeese Monk, came to India in 1903 and made Mahaparinivana Temple into a living shrine. 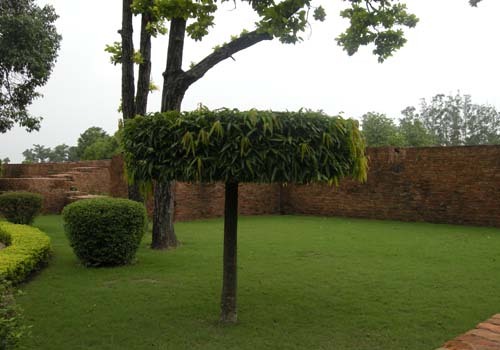 Kushinagar is also referred as the land of Kusa, son of Rama. Ayodhya is not far away so this looks logical. After maneuvering the road side shops, we parked our car just outside the main stupa. The structure is now under ‘Archaeological Survey Of India’ and I could see that lot of good development has happened over last five years. There are large lawns, separated by clean and tidy pathways, flanked with bushes. You can see the remains of old structures which were excavated in 19th century. The main stupa is not entirely visible from the entrance, you take a circuited route, passing the bell. It was late afternoon and there were not too many people. It stands atop a height and looks very modern. I do not remember this from my last visit and this could be a result of some recent renovation. As you enter the main stupa, you see Lord Buddha taking rest. This statue was also discovered during excavations. Its a large high roof hall with nothing much except the large image which you look at and feel blessed. The actual cremation ground is a bit away and I didn’t go there this time. The area has lots of temples built by many countries which practice Buddhism. There are good hotels as well, including Taj and I clearly remember that there were internet kiosks five year back. We wanted to be in Gorakhpur so we rushed out , we did go to one more monastery though. Doing Sarnath and Kushinagar was not planned and I happened to be there, may be it was destined that way. And this finishes my long drive to east. Hope you enjoyed it. Informative and very enjoyable series. Though heard of all these places location was uncertain. Now the picture is very clear. Thanks a lot. Any idea how such a place got buried under mud? Now this is simply an astounding post. I have heard and read about Bodh Gaya, Sarnath, Vaishali, etc, but very honestly I was not aware about Kushinagar. Thank you for taking us on this extremely well narrated journey to Kushinagar. I will sit down with you one of these days and understand about the exacavations of the sites after all these centuries. soonest. Incidentally, some of the pitures are superb. Thanks once again and God’s blessings. Thanks Nandan for this beautifully compiled story. The reclining Buddha statue is magnificient. You certainly have been destined to be in his presence and bring us back these wonderful pictures. 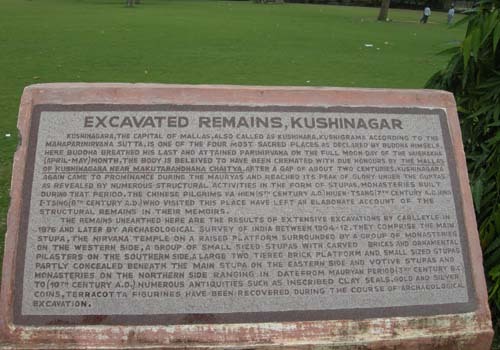 I’ve read in textbooks about Kushinagar but they were just few bland factual lines. Your story makes the place real and puts it on the wannabe traveller’s map. Short and of course sweet post from Kushinagar the place of Mahaparinirvan-the final journey. The combination of oblivious and seasoned crew halfs works well:) as many times the oblivious half wisely restrains the seasoned one from stopping and bashing up the jaywalkers. I wonder whether there should not be a car with mechanised whip and a loudspeaker as standard fitment, only to driven by really seasoned and responsible drivers. Wow !! What a post. Looks like Kushinagar should be added in my ever growing list. Again, since this post is about a place in Bihar, how do you weigh going there by train instead of a private vehicle ? I am linking this post to Blogbharti here. Cuckoo – Big thanks for linking at blogbharti. 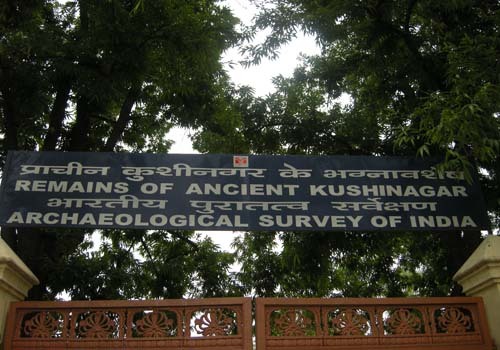 Kushinagar happens to be in Uttar Pradesh, on the border. Its not too far from Gorakhpur which is very well connected in terms of rail and road. Gorakhpur also happens to be the last town for one of the popular Indo-Nepal border, Sunauli. I was in car, mostly by-chance as I took this route while driving back. Probably the home sickness took over and I didn’t spend much time in Gorakhpur and beyond and I really miss not being able to cover the twin cities of Ayodha and Faizabad which I passed through on my way to Delhi. Saryu was charming and the ghats looked more haunted then else. May be it was right in the day. Anway, thanks again. Keep reading. Rajiv – So you read that. :). I think the real seasoned doesn’t get affected by jay-walkers, I am not yet there though. Apart from loudspeaker, a large light on the back side for the ones who always drive in high-beam. I am learning to not fix these guys and do my own business well, not very successful so far but going good. Geetha – Thanks. Speak to me please , whenever you firm up your plans. You can club couple of other things with this trip. Ram – Thanks for all the praise. I think I was just plain lucky to find this place. I dont think its popular beyond Buddhists. May be this post and your comments and linking at other sites, spreads a little word. whatever little. The really seasoned ones do not care. You know what I mean. They are usually found at the dhabas near the Vijay Nagar Chungi. Yes, that is needed as well. Someone told me to fix the angle of the RWM such that the headlights are reflected back to the driver at the hind, to give him a tatse , well glare of his own light… But I guess it does not work as the mirror is concave and he will see only tiny dot of light as the refelection of his high beam headlights. Let me also add that before reading this post all I knew about kushinagar express that there is train from Mumbai to gorakhpur by name of Kushinagar express. Once again, thanks for those splendid pics. 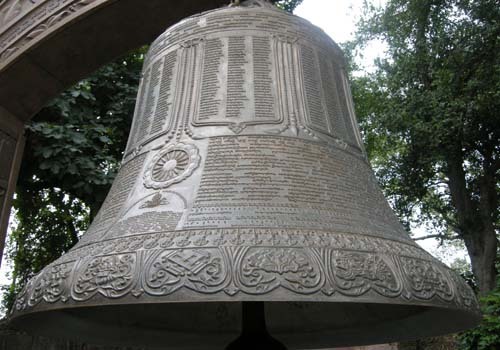 The Bell is really a work of some art. A pity that we have lost all that craftsmanship to perspicuousness. I have a theory on mud. May be it was the c(o)urse of kosi? From what I remember, there was an earthquake (or a series of them) and the entire place, as it is, went under the earth. And they just broke open the upper crust and bingo! There it was – a hostel of sorts with low ceilings. And hey, to add to your answer to Cuckoo, trains to Gorakhpur are definitely a better option – for the headquarters of the North Eastern Railways (the biggest Broad Gauge railway junction in North India). Infact the rail network of Gorakhpur connects to almost every major city in India. I read each & every post of Ghumakkar. Time constraints don’t allow me to comment frequently. Yes, I am aware of Sanauli. Had gone to Nepal from that route only but we had gotten down at Mujjafarpur & then Sanauli. Whale of an experience that was. Wow! Everyone is talking of trains here. And so much information is coming out. I an glad Smita that you liked the pun. I really feel sad about the floods. Cuckoo – No problems. Actually I consider Gorakhpur as part of Bihar only :) though no one from UP agrees with me on this. Its been a while you wrote here, write when you find time. Great post Nandan..Ive been wanting to do the Buddhist trail for a while and this is fantastic .. I am not sure about Lumbini (which is in Nepal) but Bodh Gaya, Sarnath and Kushinagar are all in drivable distance to each other. I am sure there would be good train connections as well since they are close to big places like Patna, Banaras and Gorakhpur. Thanks Nandan for bringing Kushinagar back into my thoughts. I was born there and spent the first 8 years of my life there. It was so beautiful then and I remember seeing the stupas and the Budddha statue then and feeling overwhlemed. I agree that it’s just plain incompetence of the government that such a beautiful and historical place has not been marketed well. Life has taken me from Kushinagar to Gorakhpur to Lucknow to Kanpur to Calcutta to Ahmedabad to Boston to San Francisco, I promise to myself that I’ll visit Kushinagar on my next India trip. Thanks Bhaskar for introducing me to this blog. Thanks Lokesh. We are all meeting new people and learning new things. I at least never imagined that I would find someone from Kushinagar. Wow. You seem to been to lot of places. If you feel like it then write at ghumakkar for some of your travel experiences. Reading such a well written entry is very enjoyable. Your entry made me understand how to express a very short trip wonderfully. The description of the place is a store of knowledge. The sequence of placing the facts ,pictures, your memories is really appreciable. It is really a great fun reading such well managed entries. Thanks Swasti. Glad that you liked it. Thanks MK. You keep me waiting. Visit often. This paragraph is a mere distraction. Even though a 2500 year old tradition was deliberately destroyed, its greatness is such that even now it emerges victorious. Dear Patrick Jones, here is the answer to your question. Pusyamitra Shunga is believed in tradition to have been hostile towards Buddhists and to have persecuted the Buddhist faith. “Then King Pusyamitra equipped a fourfold army, and intending to destroy the Buddhist religion, he went to the Kukkutarama. (…) Pusyamitra therefore destroyed the sangharama, killed the monks there, and departed. After some time, he arrived in Sakala, and proclaimed that he would give a hundred dinara reward to whoever brought him the head of a Buddhist monk” (Shramanas) Ashokavadana, 133, trans. John Strong. A Buddhist tradition holds him as having taken steps to check the spread of Buddhism as “the number one enemy of the sons of the Shakya’s and a most cruel persecutor of the religion”. The Divyavadana ascribes to him the razing of stupas and viharas built by Ashoka, and describes him as one who wanted to undo the work of Ashoka. In ancient times, Kushinagar was known as Kushinara and was a small town of not great significance in the Malla dynasty. 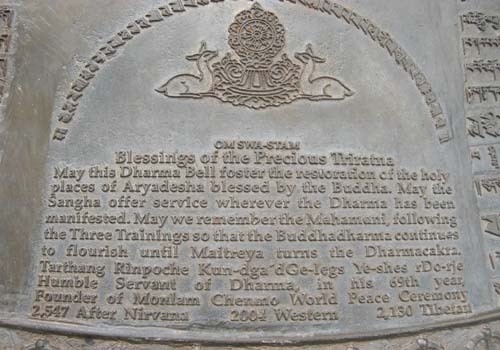 The actual site of the original town has not been established, but the site of the Buddha�s death was one of the four major sites of Buddhist pilgrimage. It was here that the Buddha died and was cremated and achieved the Parinirvana. The last rites were performed with all the honour that is due to a universal monarch or Chakravartin, as he was held in reverence by all people. The kings of eight Indian states of the Gangetic basin came for the funeral rites and divided his ashes in eight parts. Each king carried these back to his kingdom and built a �Stupa� over the mortal remains of Lord Buddha. On the Buddha�s death, the various monasteries were established which flourished until the last Buddhist monastery was destroyed at Nalanda in the 13th century. There were eight groups of monasteries, stupas and images, indicating that Kushinagar was a substantial community. I did not like the renovation of the main stupa to such a large extent. Renovation is fine but the originality and authenticity should not be tampered. Pangong Lake – Travelers’ Delight! 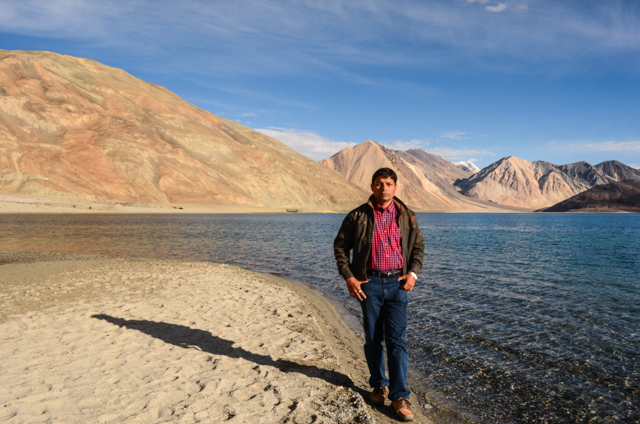 The last leg of our journey to the mystical and majestic Ladakh was ‘Pangong Tso’! In local language Lake is called Tso. Pangong Lake falls in the disputed territory with China. So the whole lake does not belong to India. While China occupies two-third part of this magnificent high altitude lake, India remains satisfied with mere one-third part of it. These days the Lake is a favourite tourist place among the domestic tourists much credit for which goes to the bollywood movie ‘3idiots’! ……. How incredible it was to see the tranquil lake and its azure blue waters! Pangong Tso is one of the largest saline lakes in Asia. On the Lake shore we walked and saw the effects of changing colours of the lake, aqua green to indigo blue! The saline water of the lake plays with the sunlight and produces different colours. We were told that during winter the lake freezes and become a solid surface to walk over it. Well, walking over a frozen lake! You need to check certainly the best season to visit there!